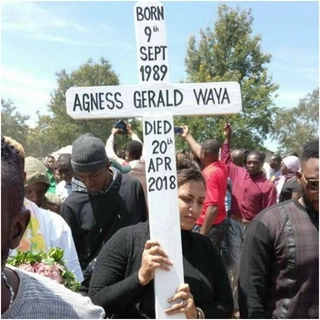 A cloud of sorrow on Sunday, April 22, hang over thousands of mourners who had traveled to a quiet town of Mbeya, to pay last tribute to Tanzanian socialite and video vixen Agnes Masogange. Mbeya is in the southwest of Dar es Salaam. The grief was written all over the faces of those present at the Sunday afternoon burial as the the body of the popular celebrity socialite was lowered to its final resting place. The burial of the video queen was preceded by a requiem mass at Leaders Club where a host top Tanzanian celebrities and fans had gathered. Photo: Official Agnes1/Instagram. 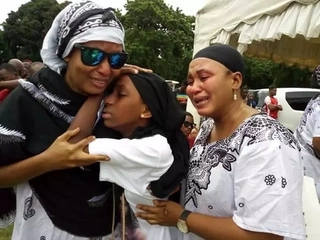 The burial of the video queen was preceded by a requiem mass at Leaders Club in Dar es Salaam where a host of top Tanzanian celebrities and fans had gathered. Celebrities Ali Kiba, Harmonize, Diamond Platnumz, Tunda, Jacqueline Wolper, Irene Uwoya, Rammy Galis, and Idris Sultan among other sat pensively as one after the other eulogised Masogange. Masogange passed on at the Mama Ngoma Hospital, in Dar es Salaam where she had been receiving treatment for a day. Photo: Azam TV. It was also a rare occasion that also saw Diamond and Kiba share a podium together in awhile despite being bitter rivals. Masogange passed on at the Mama Ngoma Hospital, in Dar es Salaam where she had been receiving treatment for a day. Her father Gerald Waya (in half coat) on eulogised his late daughter as a hardworking and honest lady who had built her a decent house. Photo: Azam TV. According to Global Publishers, the socialite succumbed to typhoid and low blood pressure. 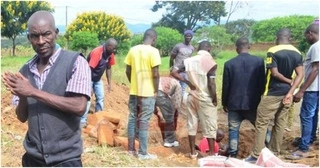 Her father Gerald Waya on Sunday, April 22, eulogised his late daughter as a hardworking and honest lady who had built her a decent house.